Some glass cutters forget that many windows serve a function other than keeping the weather out: they are moving parts. A properly finished edge reduces the friction between the window and the rail or runner, providing a smoother operation and cleaner look. We pencil grind to a satin finish (Replacement Grade) or polish (Concours Grade) those edges that are exposed. The result is that your window will look good and function properly. We’ve received many calls from customers that previously bought from our competitors only to regret their purchase on this point alone. 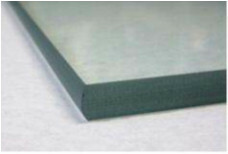 Black Edge – Black edging refers to the process used to seal the exposed edges of laminated safety glass and was necessary in the early years of automobile manufacturing. Pencil Grind – This edge is finished so it is slightly rounded and has a matte, frosty or satin finish. Pencil Polish – This finish is very popular. The end result is a glass edge that has a slightly rounded shape and is shiny and glossy. Above is a sample of our machine cut and satin finished edge. A proper edge should have no chips or undercuts, and should be uniform. This can only be accomplished using an edging machine.